Quartets were my first Klipsch Speakers. Enjoyed them until I joined the Forum and found a pair of Forte IIs. Used the Forte's in two channel and both speakers in an HT set-up along with an Academy. The Forte IIs sound better to me. Smoother with more base and a better sound stage. When a Forum member made a pair of Cornwalls available to me I sold the Quartets. They're both great speakers but I have to give a sizable edge to the Forte IIs. I currently use a pair in my main 2 channel system. I'm thinking you'll pay more for the Forte IIs. Probably a two or three hundred more. $350 - $400 for Quartets and $500 to $700 for the Forte IIs depending on condition. Too bad you're a long way from the Midwest. I may be selling my Forte IIs within the next month or so. Sweet as they are, I have too many Cornwalls and something has to go. I think I read, (on the Forum) that Paul Klipsch had a thing for the Forte II. Both are awesome. With subwoofer, dead heat. Without sub, very slight advantage to the forte' IIs. I have Quartets (too bad your so far away as I'd like to move them) and had both Forte models. Forte will naturally play "bigger" but the family signature is present. I would look for Forte 2 as they use the tractrix horns. If I'm not mistaken Quartets also use tractrix? I also have RB75's which IMO will walk on Quartets. Too bad a pair of 75's just sold here, they are difficult to find. Buy 'em if you find 'em. The Forte II go a bit lower, have a larger woofer and passive, and a more sophisticated crossover. It is taller and that puts the mid and tweet up at ear level if you're sitting down. It is arguably the better of the two for those reasons. They both have the same mid and treble horn. OTOH, if you're up against a size problem, the Quartet is the way to go. Price is a difficult subject. It would depend on condition and whether the seller is close enough to allow you to pick them up in a car. Shipping can get expensive. Story: I like to tell how I went to Milwaukee via Amtrac from Chicago to pick up my Forte II. The owner, who met me in the Amtrak parkinmg lot, was scrupulously honest and pointed out the mushed back lower corner. He had the original shipping boxes. Amtrak insisted on putting them in the baggage car and told me in strong tones that would cost me $5.00 no ifs ands or buts. I had to wait for the train to run south and got lunch at a downtown mall which had a department store right out of A Christmas Story. Then back in Chicago, the luggage people couldn't find them. OMGosh, they're still in Milwaukee. But they eventually found them in a sub-level of Union Station. I wheeled them on a luggage cart some five blocks to the office, including transversing a bridge over the Chicago River. That's when the snow started. The next day I went to the Sony store on Michigan Avenue and purchased a mini-system which had 4 ohm shoebox size speakers and maybe T-Amps. Thanks for sharing & great story. I bet it's that much more satisfying to have them because of your travel experience in going to get them. Too bad you're a long way from the Midwest. I may be selling my Forte IIs within the next month or so. Sweet as they are, I have too many Cornwalls and something has to go. I think I read, (on the Forum) that Paul Klipsch had a thing for the Forte II. OK, so looks like Forte II's are clear winners over Quartets. Good to know! How far from the walls do you need to place Forte II's? How would they do in home theater, either as mains or as surround speakers? You poor man, you have the sickness like the rest of us. I have to let you know, there is no cure. Just keep feeding the need and may God help you. 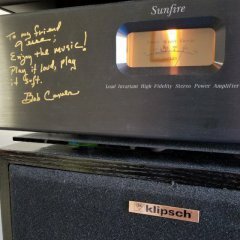 Forte II's are what got me into Klipsch and really just a great all around speaker. Quartets are ok but lack bass. I'll keep you in mind. I'm around Milwaukee but might be willing to drive a bit, (if there's a quality golf course in the area). BTW, the Forte IIs mixed quite well with the Quartets in the HT set-up. Like I mentioned, I used an Academy, (could be available too) for the center and an RSW 10 sub. I'm not sure it wasn't close to par with Cornwalls that I use in HT now. The Forte IIs are walnut, no dents and 90% condition. If you consider the Forte' II don't pass by some good Forte' I. Both speakers sound great. One has a bit more vertical coverage and the other a bit better in the horizontal coverage I've heard both and had the Forte' I.
I agree with the above, the Forte I and II are probably (in my opinion) about 95% the same, with the II being slightly more refined. Both are excellent and ahead of the Quartet. Thanks - will check out the pair near me if still available.